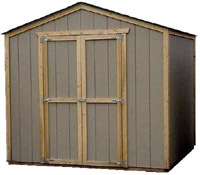 CLASSIC BARN is offered in 8' and 10' gambrel widths. 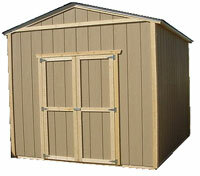 The CLASSIC BARN has a 4' tall sidewall with peak heights that range from 8' to 9' depending on width of building. 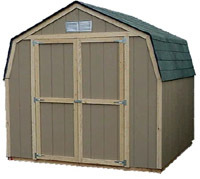 Door placement is restricted to the 8' or 10' gambrel end- centered. CLASSIC HOUSE is available in 6', 8' and 10' gable widths. The CLASSIC HOUSE has a 6' sidewall with peak height of 8'. Door placement is available on the sidewall or endwall. CLASSIC TALL HOUSE is available in 6', 8' and 10' gable widths. The CLASSIC TALL HOUSE has an 8' sidewall with a peak height of 10'. Door placement is available on the sidewall or endwall. Foundation: Rows of 2"x8"x16" concrete stones spaced out under 2"x4" pressure treated skids so that no wood touches the ground. This allows for water drainage & ventilation under the floor which can increase the longevity of your floor. Floor: 2"x4" floor joist 16" on center and heavy duty 3/4" tongue & groove, OSB floor sheathing. A steel threshold protects every door entry. Walls: 2"x4" wall studs placed on 24" centers with 1/2" LP SmartSide w/ grooves 8" on center. SmartSide is resistant to termites and fungal decay and has a pre-primed surface that is ready for paint. Doors: 48" double doors (2- 24" doors) are our standard. Our doors are equipped with 6 heavy duty "T" hinges with a closing hasp for pad lock. Roof: 2"x4" trusses are on 24" centers that are joined in the center by 20 gauge metal press plates designed for trusses. 7/16" OSB roof sheathing with 15# felt and 25 year composition 3 tab shingles (Four standard colors to choose from).